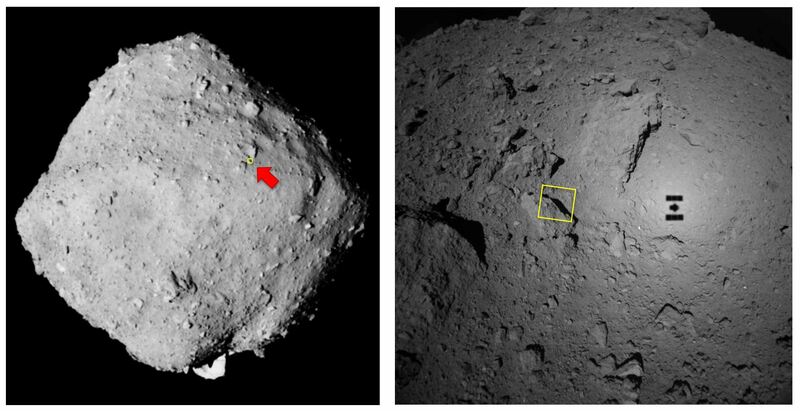 When Hayabusa2 descended towards Ryugu for the MINERVA-II1 deployment operation, the ONC-T (Optical Navigation Camera - Telescopic) captured images at the highest resolution to date. Figure 1. 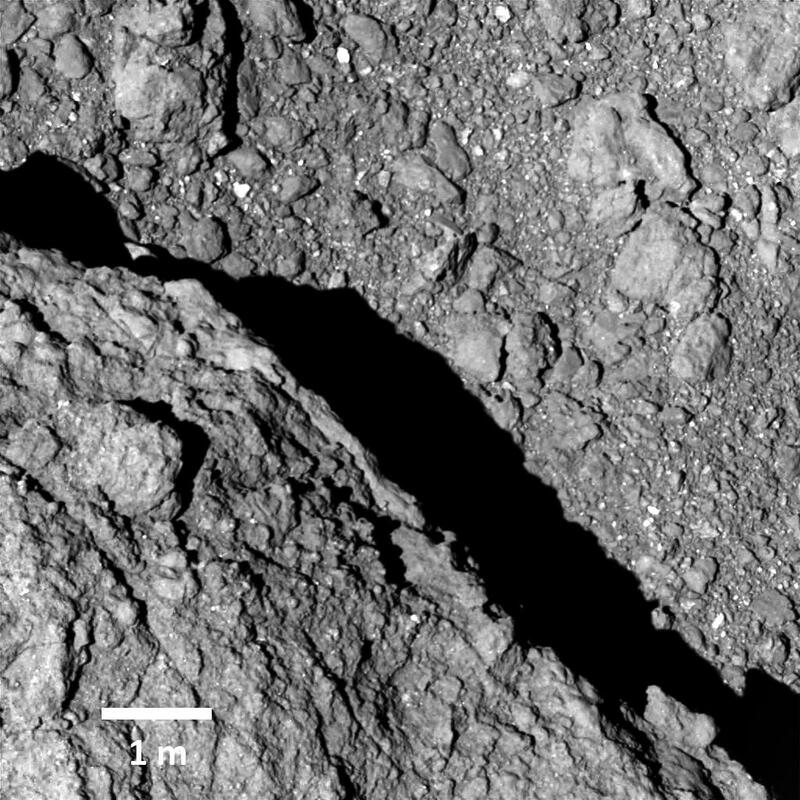 Image of Ryugu captured by the ONC-T at an altitude of about 64m. Image was taken on September 21, 2018 at around 13:04 JST.This is the highest resolution photograph obtained of the surface of Ryugu. Bottom left is a large boulder. (Image credit※: JAXA, University of Tokyo, Kochi University, Rikkyo University, Nagoya University, Chiba Institute of Technology, Meiji University, Aizu University, AIST). 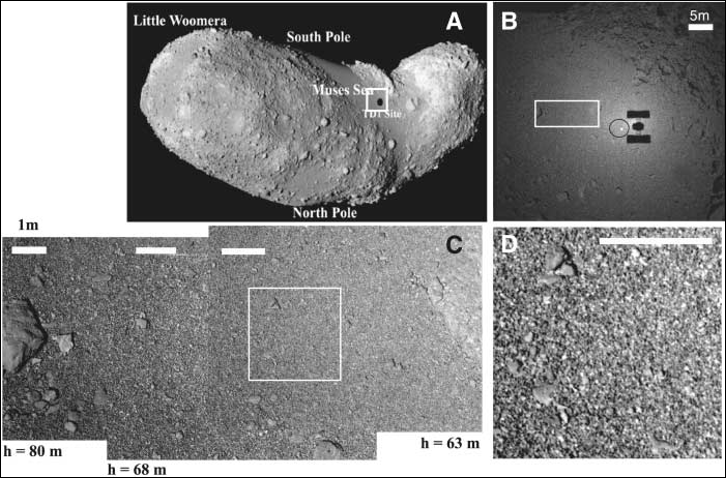 This next figure shows the location of Figure 1 on Ryugu. Figure 2. Region of the highest resolution image. Yellow boxes correspond to the region in Figure 1. (Left) The region is shown on the ONC-T global image of Ryugu. (Right) ONC-W1 image, taken at 70 m height. 2018-09-21 13:02(JST). (Image credit※: JAXA, University of Tokyo, Kochi University, Rikkyo University, Nagoya University, Chiba Institute of Technology, Meiji University, Aizu University, AIST). Figure 3. High resolution image of the surface of asteroid Itokawa photographed by Hayabusa. "D" is taken from an altitude of 63m. It is thought that the so-called "Muses Sea" (official name "MUSES-C Regio") is covered with a "gravel" of granules with diameters from a few mm to few cm.